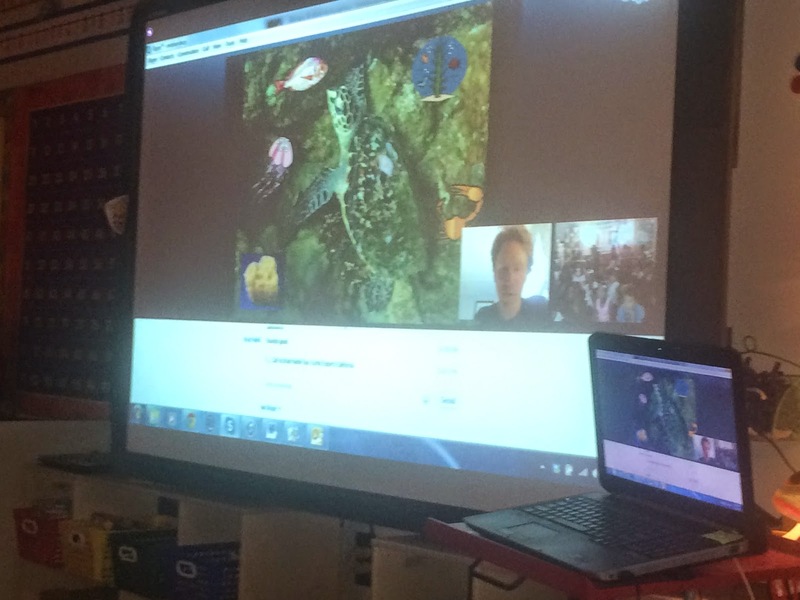 Today our 2nd grade was privileged to speak with Mr. Brad Nahill, the Director and Co-Founder of See Turtles, an organization dedicated to the conservation of Sea Turtles worldwide. 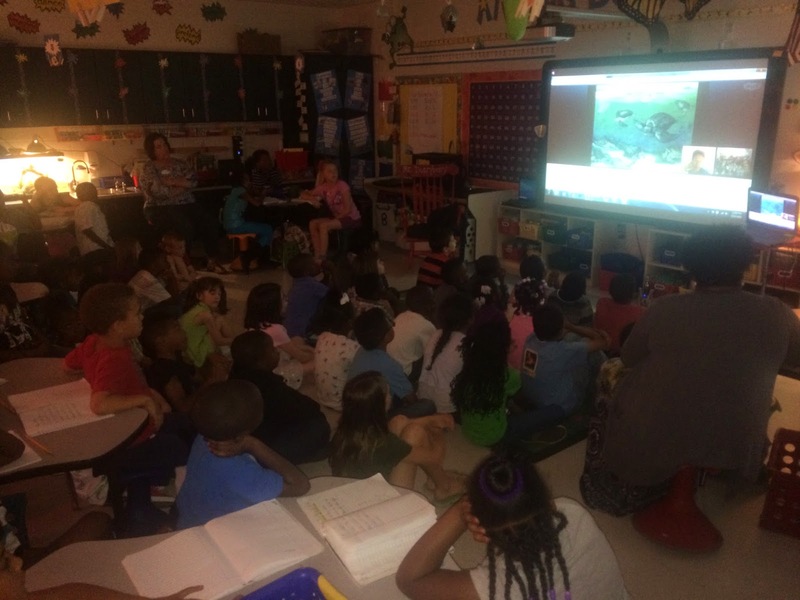 Thanks to the power of Skype, Mr. Nahill was in his home in Oregon, and we were in the best learning environment around, room 102! It was a great experience for our students. Mr. Nahill had a great presentation that was perfect for our 2nd grade study of Sea Turtles, their habitat, and ways to protect them. After the presentation, students had the opportunity to ask questions they formed after doing their own research. We were even able to teach Mr. Nahill a thing or two about our own South Carolina State Reptile, the Loggerhead Sea Turtle! What a great afternoon of learning we had! 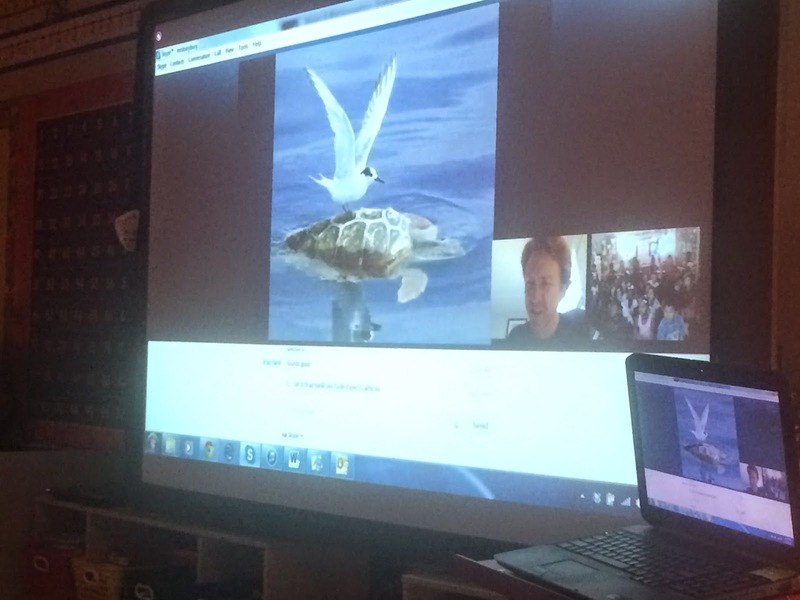 If you would like for Mr. Nahill to present to your students, go to https://education.skype.com/ and search for sea turtles! After the lesson, the students wrote thank you notes to Mr. Brad and told him 3 things they learned from his presentation. I hope he likes the cards! Here is a peek of a few! In her writing, she wrote about the impact I made on her son this year and I had inspired him to want to become a teacher. Notes like that really validate the work I do so much! Knowing that I am molding and inspiring future educators at this stage in their lives is an overwhelming honor! Regardless of what paths my students choose, I know they will be amazing in the future, because they are so amazing now! Here is a pic of the future Mr. Bates. He asked me if he could read a book to the class. Of course I obliged! He did fantastic!!! 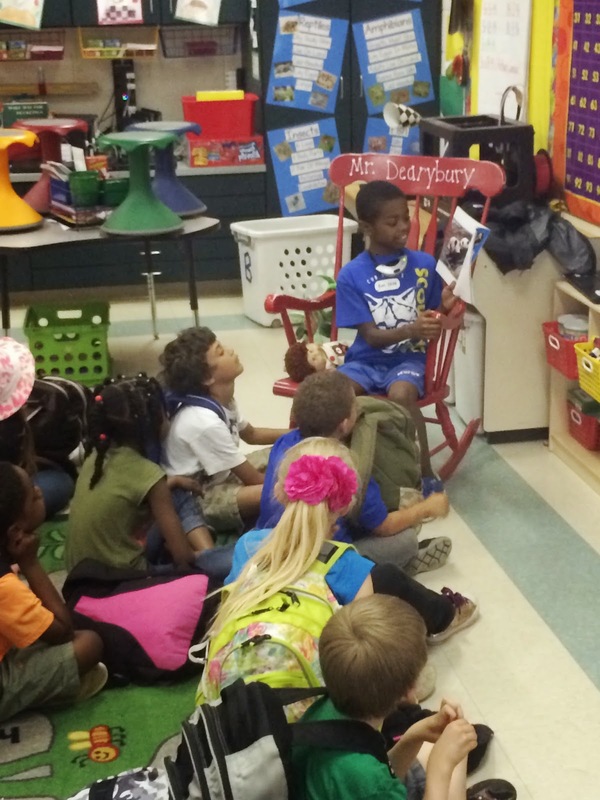 He even reminded one student the importance of staying seated during story time so all could see. And I quote..."Umm, excuse me sir, you do know that there are people behind you, and you keep popping up. Let's stay on our bottom!" I was so proud to see a "mini me". I hope he is in the room right across the hall from me one day! Great job Mr. Bates!!! This morning my students had an amazing Skype experience as they heard kids from Kenya, Venezuela, and Pennsylvania sing songs they had learned in their classroom. It was an awesome morning of musical collaboration from around the world. We heard native songs from Kenya about making friends in school, and a national song from Venezuela about the history of their country. The students from Pennsylvania showed off their singing skills with songs from Frozen! 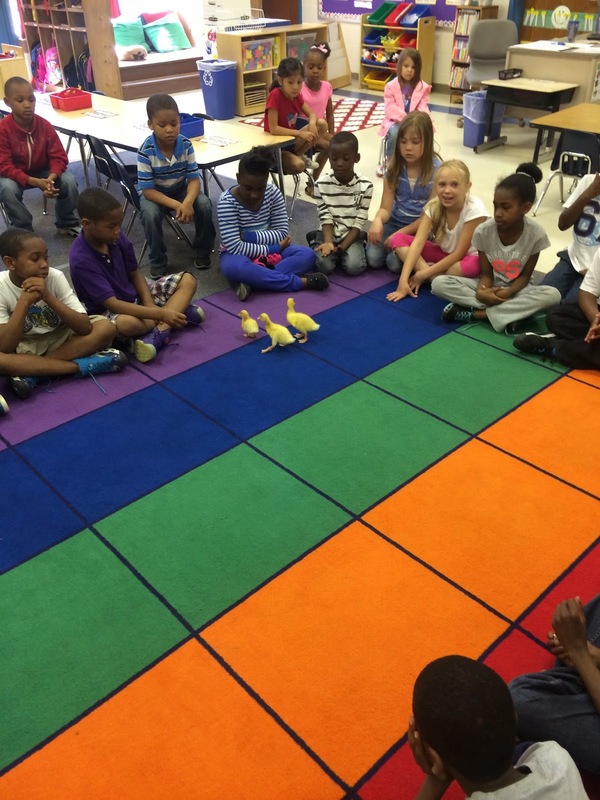 Our class sang "The Continent Song", "Do You Want To Read A Story", and "The Ballad of Johnny Appleseed". Here is just a snippet of some of the fun we had. The students from Venezuela sang "Happy", by Pharrell Williams. The neatest part about this morning was being able to peek into the lives of students from around the world. We were able to ask questions about their weather, animals, food, songs, and learn about what they do for fun. It was amazing to see the differences, but even more amazing to see how alike we all really are. 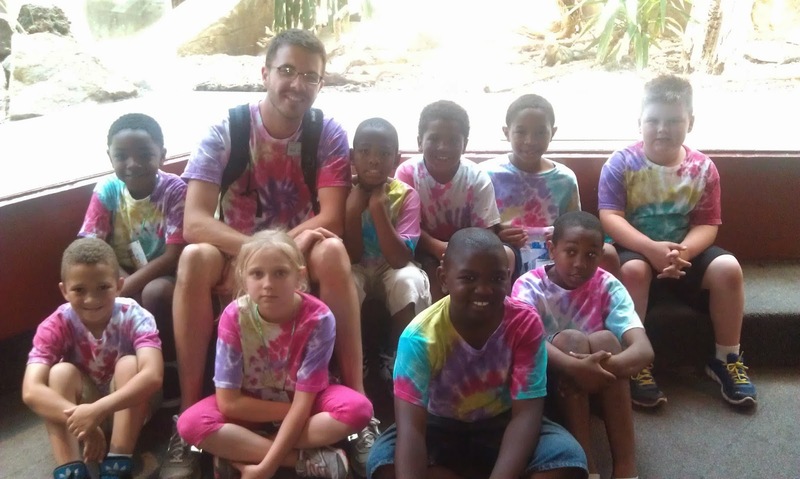 So glad I could have this experience for my students! The "Skype" Is The Limit! 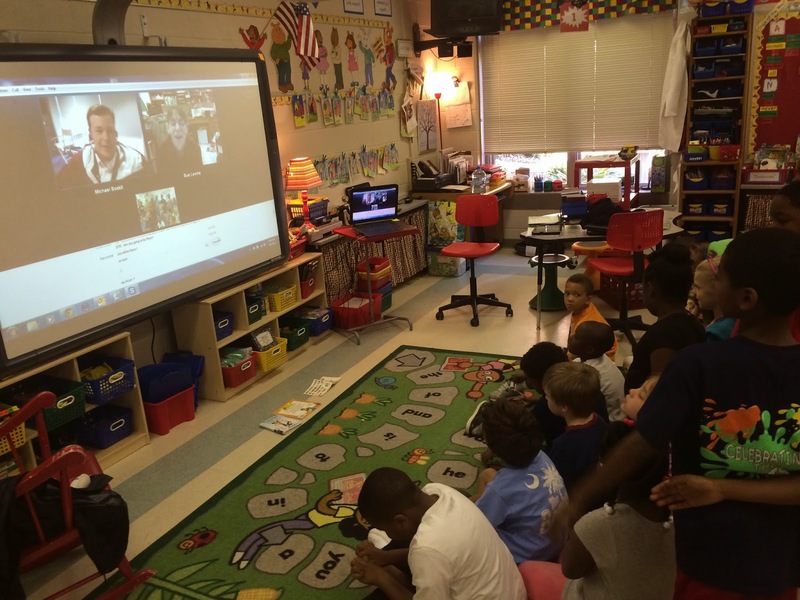 Today my class had their first Skype experience in the classroom. It was so much fun! 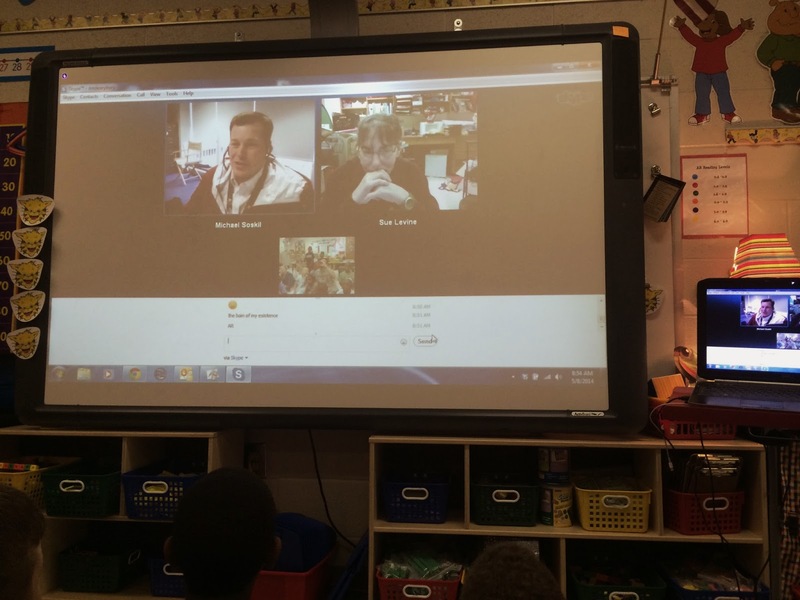 Students connected with a technology coach from Pennsylvania and a Media Specialist from Georgia! They played the mystery game about our recent trip to the zoo and had a rehearsal for our worldwide debut of "Do You Want To Read A Story" that will happen on Monday! I say worldwide because we will be collaborating with schools in Kenya,Venezuela, and Pennsylvania! We are so excited to share the exciting times in our classroom with students all over the world. Big thanks to my friend Michael for getting us involved with this wonderful opportunity! Hopefully I will video the experience and share it with you all! Wow!!! 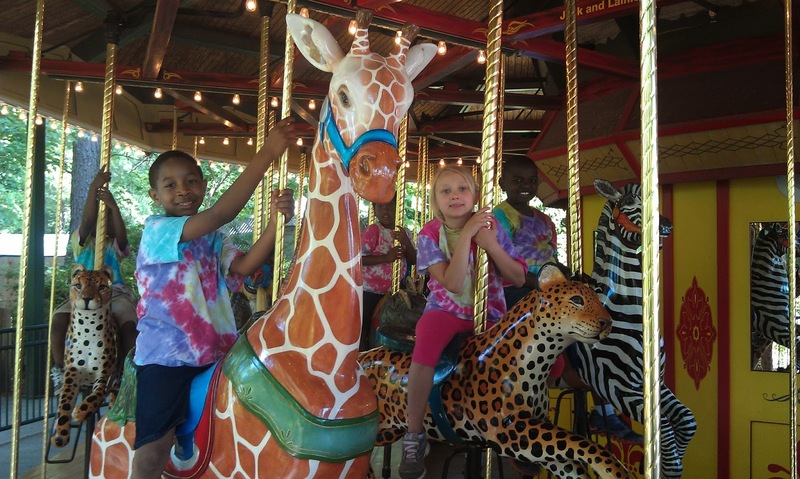 What a great day we had yesterday at Riverbanks Zoo in Columbia! It was a long, hot day, but very well worth the trip. 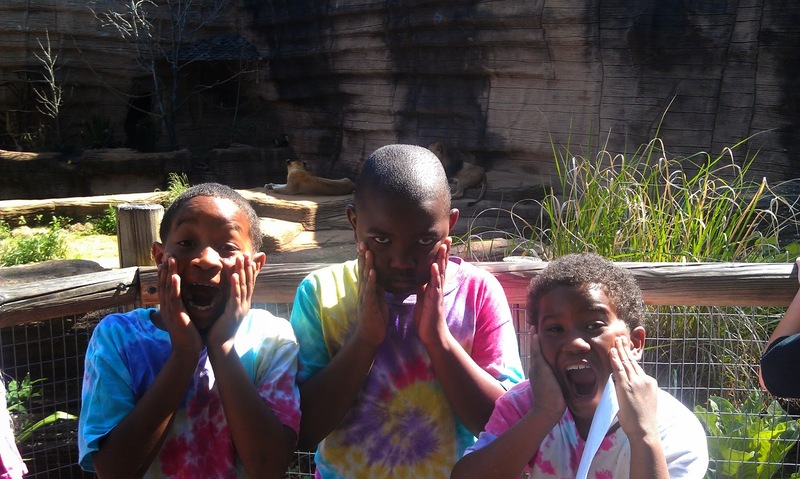 The kids had a great time and learned a lot too! We have been looking at pics this morning, and these are just a few of the over 100 photos that parents took that we liked the best! Hope you enjoy! I dream big for my students. I believe they can accomplish anything if given the right environment and support. Yesterday they proved that to be true as they learned how to create folders on their desktops and save images from the Internet into those folders to use for their animal research projects. Check out this video of two of them explaining how to do it! So proud of these guys! 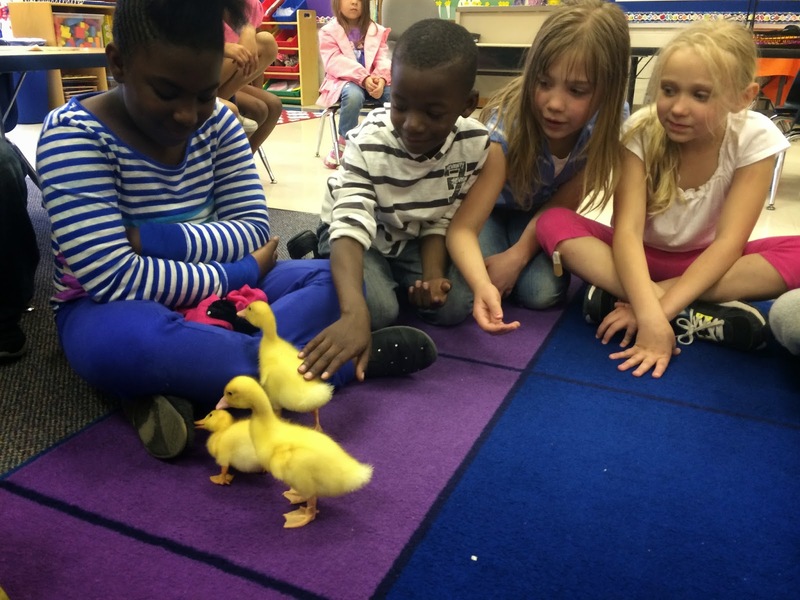 As part of our study of life cycles, we took an in school field trip today down to Ms. Switzer's K5 classroom to learn what they kindergarten students have been learning about the life cycle of ducks! 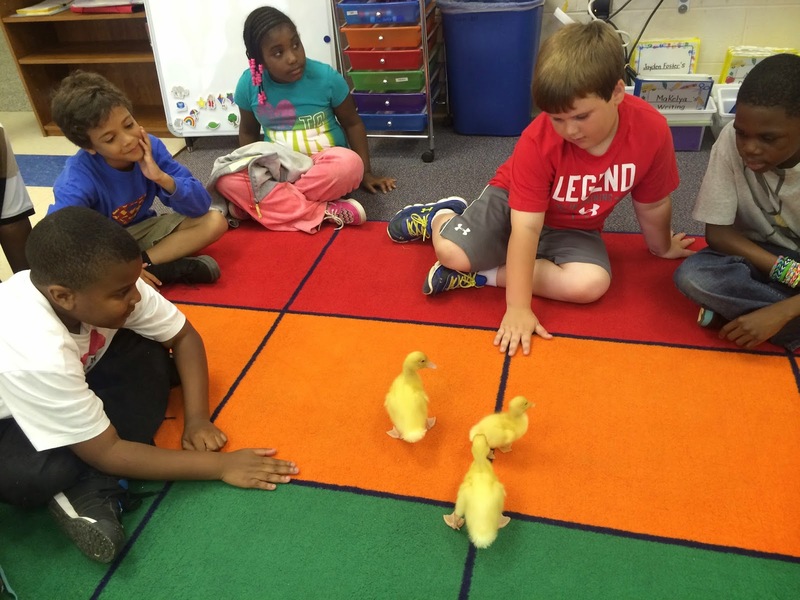 The babies were born in their classroom last week, and the room is filled with the cutest little chirping! 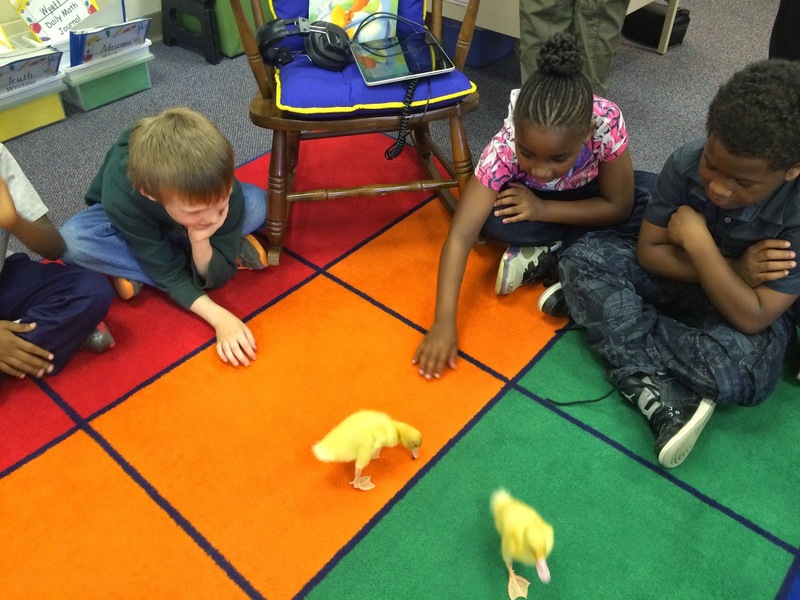 Our class loved the moments we got to spend with the ducks. The smallest one is a girl and she was feisty! 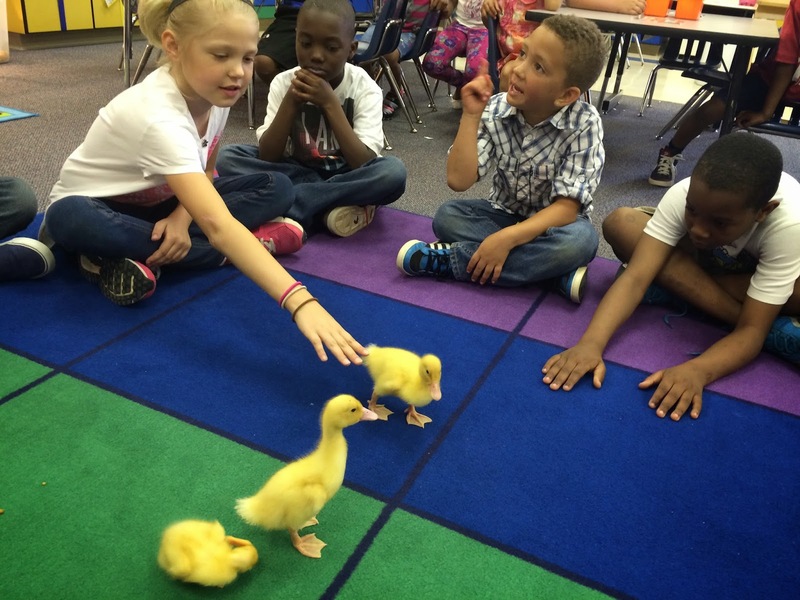 She ran all around the room and gave every student an opportunity to feel her feathers and see her beak. 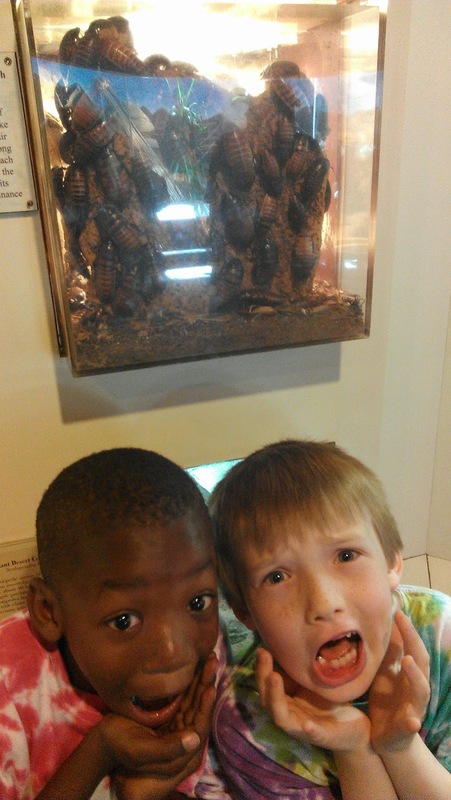 Part of the second grade curriculum requires students to know the six major animal classifications and their characteristics. This was a great hands-on way to learn those first hand! Thanks for the fun afternoon Ms. Switzer!